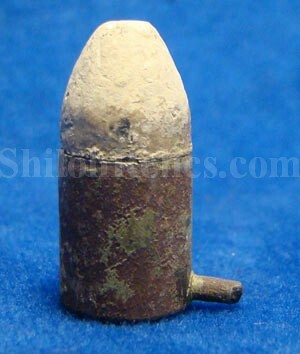 This is an original excavated metallic cartridge for the 12mm pinfire revolver. 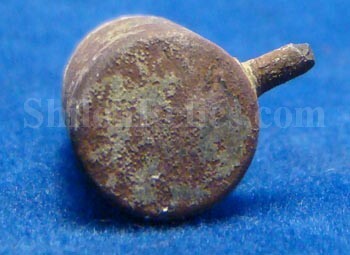 These were one of the most reliable weapons of the Civil War era. They were designed with a pin in the bottom of the cartridge. When the hammer of the revolver strikes the pin it drives the pin against the fulminate inside a percussion cap contained inside of the cartridge base. This detonates the cartridge and fires the bullet. This one is in excellent excavated condition. 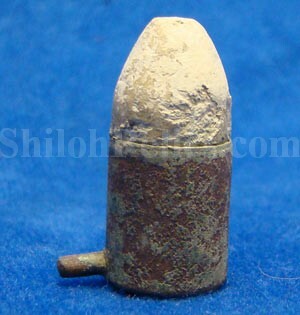 It is a fine original dug Civil War era 12mm pinfire pattern revolver bullet.